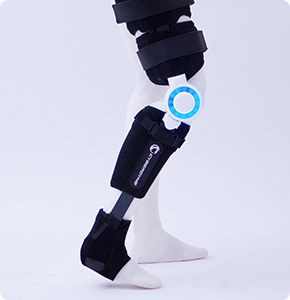 This is a model of HAL that is used for any arm and knee joints and specialized in intensive training. This assists flexion and extension exercises with a small power unit that was specially developed. The lightweight system of only 1,500g [assisting part] significantly reduces burden of daily transportation and handling of the device. All operations, such as, start/stop of assistance, alteration of settings and confirmation of motion statuses can be manipulated by one hand with a palm-sized controller. The operator can proceed training, ensuring motions of the wearer with the other hand which becomes free. With this small and lightweight HAL for Well-being Single Joint Type made of soft materials, the wearer can perform training, lying on the bed. Training with HAL for Well-being Single Joint Type can be conducted at any time and any place. When a person moves his or her body, the brain sends various signals to muscles via nerves. At that time, the signals leak out on the skin surface as BES. HAL for Well-being Single Joint Type reads the wearer’s BES and actuates its small power unit. Therefore, it is able to perform assistance in alignment with the wearer’s “will” and consequently gives the vivid feeling “I could move my joint by myself!” to the wearer. Soft materials are used at touching points of the human body and HAL for Well-being Single Joint Type. HAL that gently fits the wearer’s body shape strikes a balance between wearability and unity. 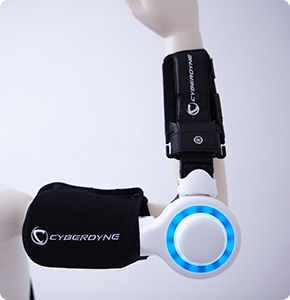 Please contact CYBERDYNE through the inquiry form, which could be accessed from the “Learn More” button or via phone. *Currently brochures are only available for medical institutions and welfare organizations. Viewer’s understanding is appreciated.